This leaching mug needs a liner glaze. Seriously! Three cone 6 commercial bottled glazes have been layered. The mug was filled with lemon juice over night. The white areas on the blue and rust areas on the brown have leached! Why? 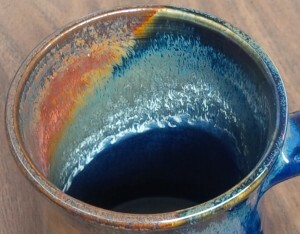 Glazes need high melt fluidity to produce reactive surfaces like this. While such are normally subject to leaching, the manufacturers were able to tune the chemistry of each to make them resistant. But the overlaps mingle well (because of the fluidity), they are new chemistries, less stable ones. What is leaching? Cobalt! Not good. What else? We do not know, these recipes are secret. It is much better to make your own transparent or white liner glaze. Not only can you pour-apply it and get very even coverage, but you know the recipe, have control, can adjust to fit your body.